With the goal of creating an amazing new residential block that is lively and flourishing with community. 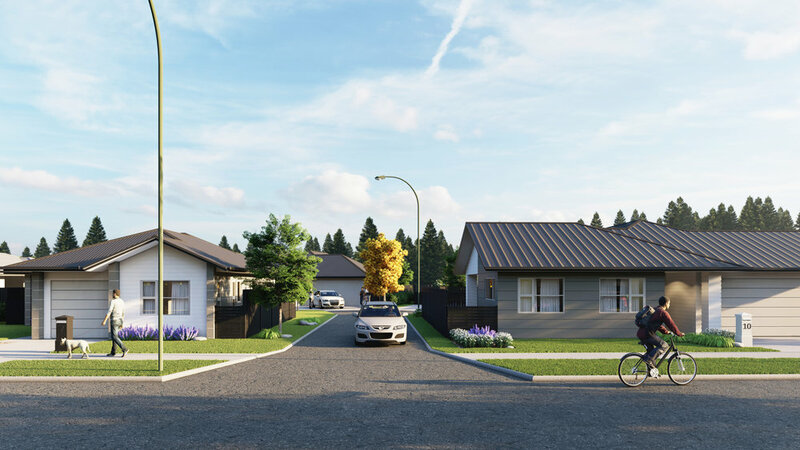 Our friends over at Friday Homes have designed this incredible new project with plans to be built in Lower Hutt, just north of Wellington in New Zealand. The new project is planned to take place in a developing area and will contain 39 New Homes based around 2 new streets and a culdesac. Each of the homes are fairly similar in structure having 3 or 4 bedrooms, with 2 bathrooms, a double garage, an open living, dining, kitchen area and a small backyard. They do however vary in exterior design which helps in providing a natural look to the overall project. To effectively get these properties on to the market before they have been built, Friday Homes got in contact with us. We were more than happy to assist them in providing a number of exterior renders of the project from a range of different angles. As seen above and below we have created 3D Streetscape Renders that capture the end of the culdesac from several angles as well as angles showing the entrance into the side street. Additionally we have added residents and cars to the shots in a live style shot that creates a really effective community finish that speaks words about the project. To finish this off we provided a 3D Site Perspective, looking at the overall project from above. Our friends over at Elevli Plus Architects are designing this amazing 10 story mixed development to be built on Islington Street in Melbourne City. Located in the busy suburb of Collingwood, this contemporary development will contain 67 unique apartments all overlooking incredible views of the city. On the Ground floor, the project will contain 2 large commercial spaces in addition to five, 1 & 2 bedroom apartments. Floors 1 - 3 have the smaller units with 1 & 2 bedrooms, 2 bathrooms, and an open living & dining that overlooks the balcony. As you move up the building, floors 4 - 6 contain slightly larger dwellings with a few 3 bedroom units available. On floor 7 you have several 3 bedroom apartments again increasing in size. Finally spread over the 8th, 9th and 10th floors, there are 5 multi story apartments that contain 3 & 4 bedrooms as well as several living areas and multiple bathrooms. To kick start this project, Elevli Plus Architects got in touch with us and explained their requirements. To assist in their marketing we provided them with a number of 3D Video Walkthroughs that take you on a tour through out 2 of their amazing apartments. 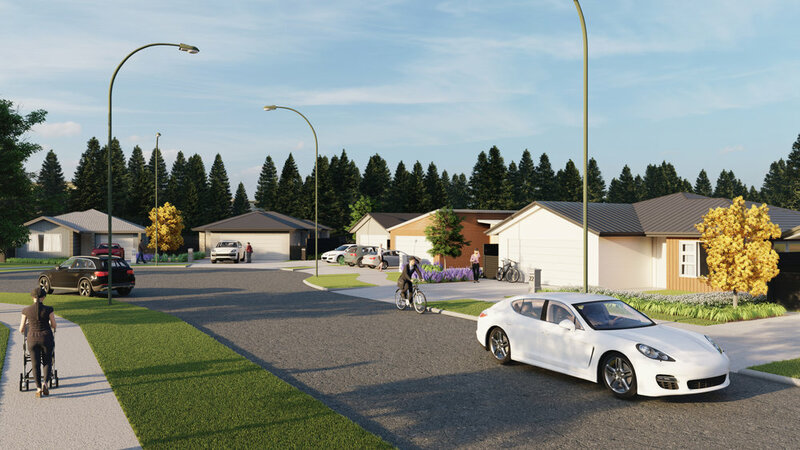 Check out this new development our friends at Blackburn Architects are planning to build along Nicklin Way on the Sunshine Coast in Queensland. Our clients are looking to completely replace the existing commercial lots to make way for a new commercial space. When our clients first came to us with this they weren’t 100% sure with how they wanted the project lay out. We worked closely with them while they were making those decisions and provided them a number of 3D Renders showcasing the final concept in the most effective way possible. We provided them with a 3D Streetscape Render looking in from Nicklin Road. Additionally we provided a 3D Site Perspective from above that was overlaid onto HD Drone Photography and really allows you to look right into the overall project.